The dsp.ParametricEQFilter object will be removed in a future release. Existing instances of the object will continue to run. For new code, use the designParamEQ function from Audio Toolbox™ instead. For more information, see Compatibility Considerations. The ParametricEQFilter object is a tunable, second-order parametric equalizer filter. Define and set up your equalizer filter. See Construction. Call step to filter each channel according to the properties of dsp.ParametricEQFilter. The behavior of step is specific to each object in the toolbox. H = dsp.ParametricEQFilter returns a second-order parametric equalizer filter that independently filters each channel of the input over time, using the default values for Bandwidth, CenterFrequency, and PeakGaindB. The center frequency and bandwidth are specified in Hz and are tunable. The peak gain (dip) is specified in dB and is also tunable. The bandwidth is measured at the arithmetic mean between the peak gain in absolute power units and one. H = dsp.ParametricEQFilter('Specification', 'Quality factor and center frequency') specifies the quality factor (Q factor) of the filter. The Q factor is defined as the center frequency/bandwidth. A higher Q factor corresponds to a narrower peak/dip. The Q factor should be a scalar value greater than 0. The Q factor is tunable. H = dsp.ParametricEQFilter('Specification', 'Coefficients') specifies the gain values for the bandwidth and center frequency. This removes the trigonometry calculations involved when the properties are tuned. The CenterFrequencyCoefficient should be a scalar between -1 and 1, with -1 corresponding to 0 Hz, and 1 corresponding to the Nyquist frequency. The BandwidthCoefficient should be a scalar between -1 and 1, with -1 corresponding to the largest bandwidth, and 1 corresponding to the smallest bandwidth. In this mode, the peak gain is specified in linear units rather than dB. H = dsp.ParametricEQFilter('Name', Value, ...) returns a parametric equalizer filter with each specified property name set to the specified value. You can specify several name-value pair arguments in any order as ('Name1',Value1,...,'NameN',ValueN). Bandwidth and center frequency — Use Bandwidth, CenterFrequency, and PeakGaindB. Quality factor and center frequency — Use QualityFactor, CenterFrequency, and PeakGaindB. Coefficients — Use BandwidthCoefficient, CenterFrequencyCoefficient, and PeakGain. The default value is Bandwidth and center frequency. Using Coefficients specifies gain values for the bandwidth and center frequency. This approach does not require the trigonometric calculations of the other two approaches where design parameters are specified in Hz. Specify the bandwidth of the filter as a finite positive numeric scalar that is less than half the sample rate of the input signal, in Hz. This property is applicable if Specification is set to Bandwidth and center frequency. The default is 2205 Hz. This property is tunable. -1 corresponds to the maximum bandwidth (SampleRate/4). 1 corresponds to the minimum bandwidth (0 Hz, that is, an allpass filter). This property is only applicable if Specification is set to Coefficients. The default is 0.72654. This property is tunable. Specify the filter's center frequency as a finite positive numeric scalar that is less than half the sample rate of the input signal, in Hz. This property is only applicable if Specification is set to Bandwidth and center frequency or Quality factor and center frequency. The default is 11025 Hz. This property is tunable. -1 corresponds to the minimum center frequency (0 Hz). 1 corresponds to the maximum center frequency (SampleRate/2 Hz). This property is only applicable if Specification is set to Coefficients. The default is 0, which corresponds to SampleRate/4 Hz. Specify the filter’s peak or dip gain in linear units. A value greater than one boosts the signal. A value less than one attenuates the signal. The default is 2 (6.0206 dB). This property is tunable. Specify the filter’s peak or dip gain in dB. A positive value boosts the signal. A negative value attenuates the signal. The default is 6.0206 dB. This property is tunable. Specify the Quality factor (Q factor) of the filter. 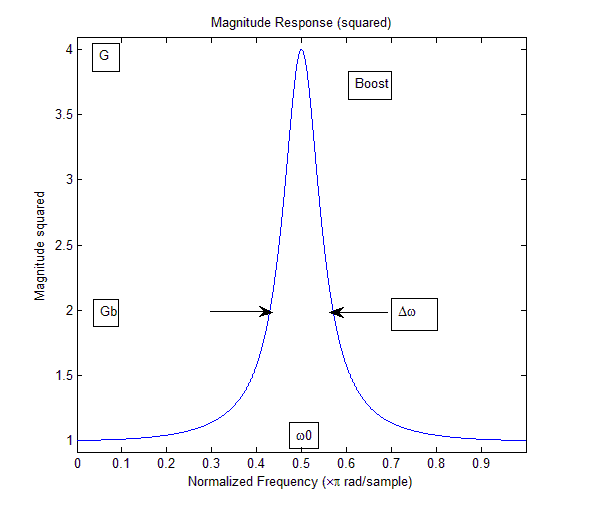 The Q factor is defined as the center frequency divided by the bandwidth. A higher Q factor corresponds to a narrower peak or dip. This property is only applicable if Specification is set to Quality factor and center frequency. The default value is 5. This property is tunable. Specify the sample rate of the input as a finite numeric scalar, in Hz. The default is 44100 Hz. Create a ParametricEQFilter object where the center frequency and bandwidth of the equalizer filter are 5000 Hz and 500 Hz respectively. The sample rate for the filter is the default, 44,100 Hz. Create objects to estimate and display the transfer function of the filter. Generate a random signal and filter the signal. The software displays the initial transfer function estimate. To continue, press any key. At i=500, the filter is tuned. The center frequency, bandwidth, and peak gain of the filter now have different values. The software displays the new transfer function. The parametric equalizer is formed by a linear combination of a peak and a notch filter. See the Algorithm section of dsp.NotchPeakFilter for details. G is the parametric equalizer gain, and GB is the bandwidth gain, that is, the gain level at which the bandwidth Δω is measured. The dsp.NotchPeakFilter that does most of the work is implemented in a decoupled way so that the center frequency can be tuned independently from the bandwidth. 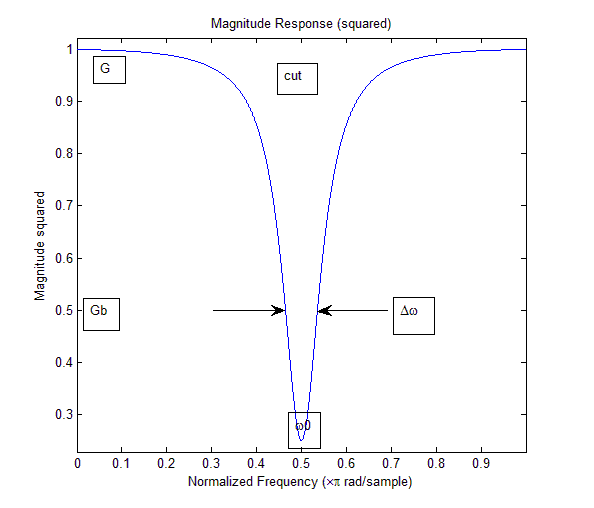 Note that the Q factor is defined as center frequency/bandwidth. dsp.ParametricEQFilter System object will be removed in a future release. Existing instances of the object continue to run. For new code, use the designParamEQ function from Audio Toolbox instead. Bandwidth is the ratio of the center frequency to the quality factor.